In the dozen or so times we’ve been, Leslie and I are always the only guests, and happily sip beers as Mr. Poong regales us with tales from his interesting life. He doesn’t need to work, he tells us, but running this tiny bar keeps him at least a little bit active. And it has another bonus; I asked him about his family, who live on nearby Phuket. “I’m happy with my wife, but I don’t like to stay. She always talking talking too much. But if I stay never mind, I shut up my ears.” I sense the male readers nodding in understanding. Mr. Poong’s romanized Burmese name is Kha Yee Thwar Thu. He told us a Thai crew member once named him Poong after Thailand’s most handsome actor. “Perfect for me” he said. Hmm? With so few customers in the current low season, our friend spends most of his time smoking and people watching from his open fronted bar. Often we’ve seen him napping at this table, or sprawled out on a camp bed near the fridge. “Customers come or not come, never mind. Sleep or wake up, never mind,” he says with a contented smile. Like Leslie and I, Mr. Poong spent a few years in South Korea. 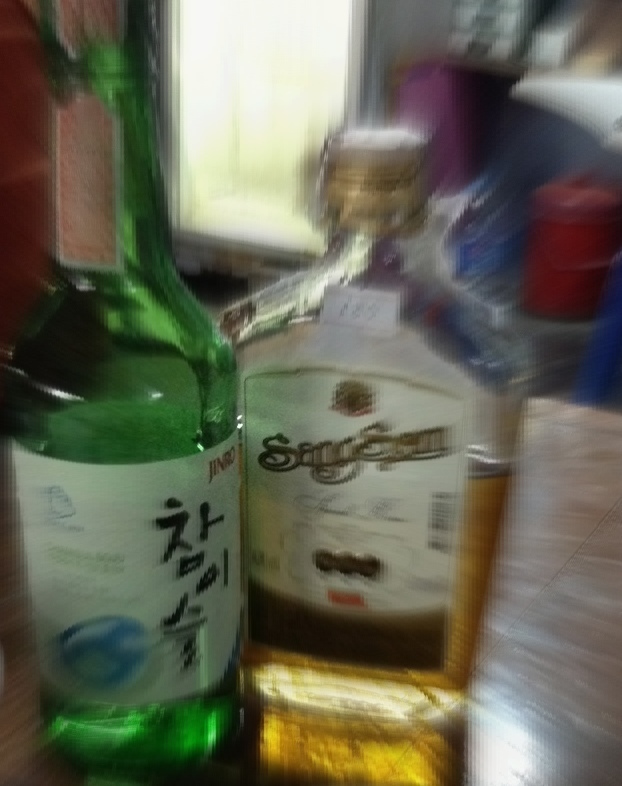 Though our jobs were very different, he a sea captain and us teachers, we shared a common pastime- drinking soju. 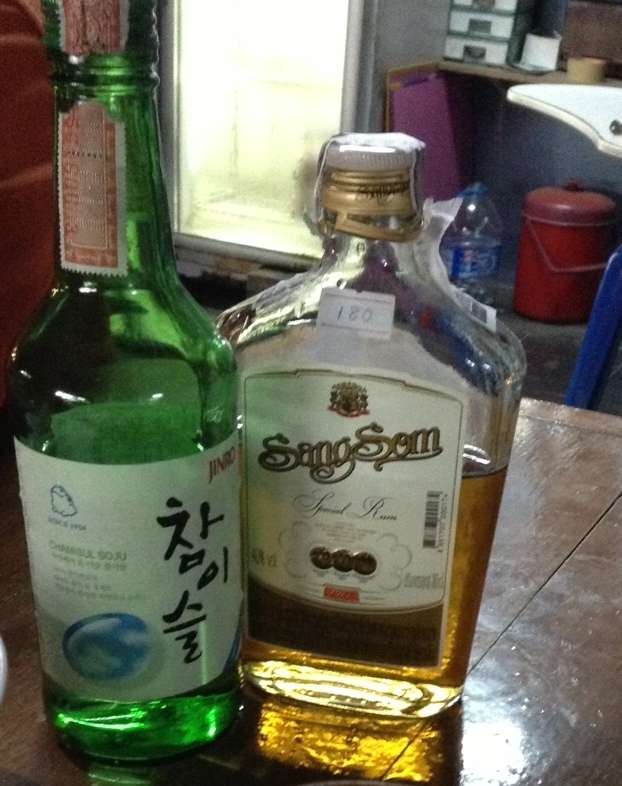 Soju is Korea’s favorite drink, and at a dollar a bottle, it’s cheaper than water. 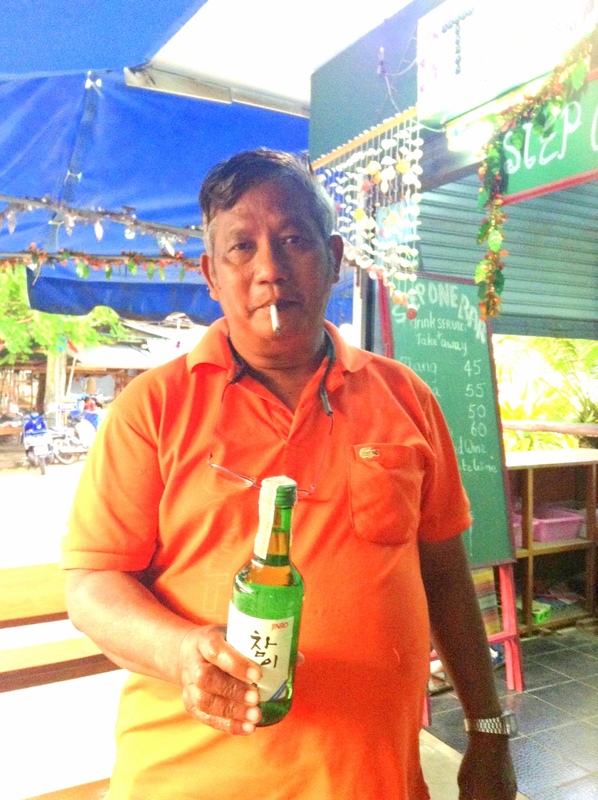 When we were last in Phuket, we bought our friend a bottle of soju as a surprise gift. Gratefully reminiscing, Mr. Poong told us “Local drinks very nice…you can travel a lot on soju.” Not sure what he meant, but we agree totally. Friday night we sat with Mr. Poong for several hours, and were treated to the usual philosophical mix of tales, including lessons on love, a chilling ghost story, his somewhat surprising indifference to Aung San Suu Kyi, and about how he often suffers racism in Thailand for being Burmese. 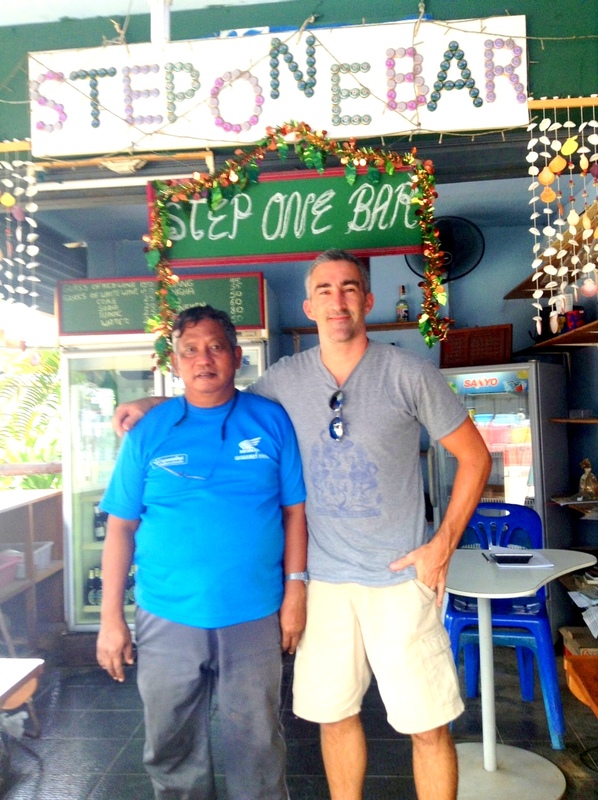 Every time we visit Mr. Poong, it seems he has a never ending treasure trove of stories, so If you’re ever on Koh Yao Noi, go and sit with him for an hour at STEPONE BAR. I guarantee you’ll hear some fun stories and get all the island gossip. And if you take him a bottle of soju, you’ll make a friend for life. Well Mr. Poong, we don’t care where you’re from…we love you anyway. CHEERS! All images courtesy of the Nomad. Steve’s blog post about our favorite character on Yao Noi – bar captain, Mr. Poong! You can definitely travel a lot on soju! Give yourself a kiss and hug and the same to Leslie! Indeed. Thanks for the comment, and hope you’re well and too exhausted after the amazing tour. Love this. The people you meet are the best part of travel. I’ve been thinking about teaching in South Korea, too. In 2014. Any tips? Hey Jessica.Thanks for the comment. Yes, it’s often about the people, and there are some great ones here. Oh Korea. Well, I highly recommend it for teaching. Great lifestyle, great fun, beautiful landscape, interesting history, close to China and Japan for trips etc.Are you interested in academy style teaching or regular public school? I taught 3 years at an academy…much better for me. Let me know what you’re thinking and I’ll give you the run down. I like your lifestyle! Any plans of going to the Philippines? Check out the stuff on my blog, especially the ones on Boracay Island, Philippines. My family’s building a 6 bedroom house for tourists. And we have one of the best beers in the world, San Miguel Beer. Hi there. Actually, I went to the Philippines…Boracay even, in April 2011, and it was beautiful. If I go again I’ll be sure to look you up. I posted 3 blogs about it…maybe you can find them? Cheers.